Every year for the past eight years, I've been documenting our Christmas trees here on the blog and it has been fun to look back. I'm not talking about the front yard trees, however. Sure, I've been doing that, too, but this post is about the trees we're had in our house. Here's the post showing our tree in 2016 - our last one in Equation Boy/Man's house. Above you see something that I've labeled V1 of our tree, because this year, we had two trees. 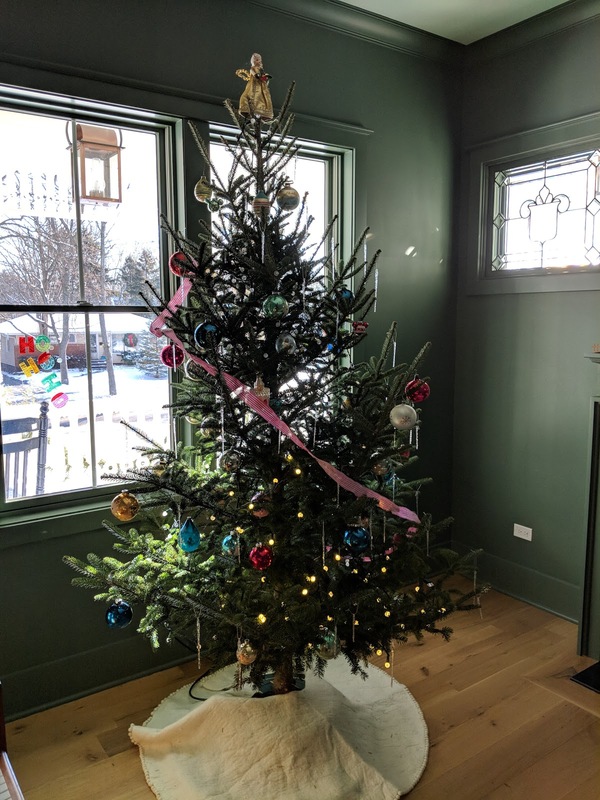 This one, in the green room, is a Fraser Fir and is adorned with vintage glass ornaments that we've acquired over the years at garage sales and estate sales. Also has an angel that we scored at a yard sale up in Michigan. I'll post a photo of the other tree from our Family Room later this week.